White vinyl magnetic sheets allow printers to print directly onto the magnetic sheets. This makes printing much quicker as printers don’t have to laminate the plain magnetic rolls themselves. Our white vinyl magnetic roll has a strong holding force, making it perfect for printing retail POS, posters and other graphics. Using a magnetic sign has the great advantage that the sign can be quickly easily removed and then reapplied as required. The magnetic material can easily be cut to size and will not scratch or mark the surface if the care instructions are carefully followed. Our customers often use white vinyl for retail displays and is very popular for creating magnetic vehicle signs. The vinyl is suitable for (eco) solvent, UV and screen printing. Our 0.6mm thick display-grade magnetic sheets are specifically designed for printers and are perfect for printed signs and graphics. They can be printed on with either UV or solvent inks. The magnetic sheets have a holding force of 40g/cm2 which is great for gripping to receptive surfaces. The magnetic holding strength does not reduce over time so your customers can use the signs again and again. 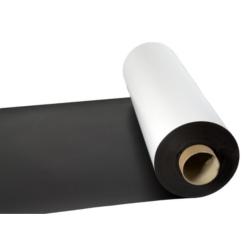 Including the vinyl coat, the vehicle grade magnetic sheet is 0.85mm thick. Our vehicle-grade magnetic sheets can be printed on with either UV or solvent inks. It has a premium holding force of 55g/cm2 especially designed for vehicle use. The magnetic holding strength does not reduce over time so your customers can use the signs again and again.